Ron Savenor of Savenor’s Butcher & Market. With the season opener behind us, it’s time to start thinking about Fenway food. It’s easy to spend a pretty penny on snacks at Fenway Park. Between the smell of griddled onions from the sausage vendors and your kids begging for soft-serve in plastic baseball hats — not to mention the ever-increasing price of beer — you are going to throw down for refreshments. But starting this year, the burgers, at least, might be worth springing for. 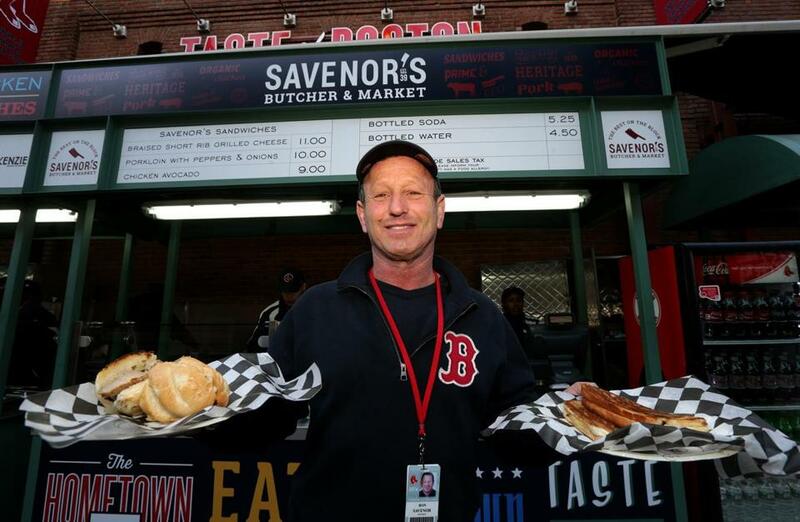 The popular Savenor’s Market is the new official butcher and meat supplier of Fenway Park. Savenor’s is known for its whole-animal butchery and an outspoken customer base including nose-to-tail chef Tony Maws and a jovial cook named Julia Child who lived around the corner from the Cambridge shop. Savenor says it all started with the hamburger. “About a year ago they were unhappy with a hamburg product they were getting and someone says, ‘Talk to Ronnie at Savenor’s, he’s got the best hamburgers.’ . . . So I said, ‘Whatever you need, I’d be glad to.’ We did this taste test and it was a hit, pretty simple. And one thing led to another.” Now Aramark sources all its burger meat from Savenor. But even those with tickets in the nosebleeds can sample the fare at the Savenor’s branded concession stand on Yawkey Way, where you’ll find specialty sandwiches from the butcher shop.